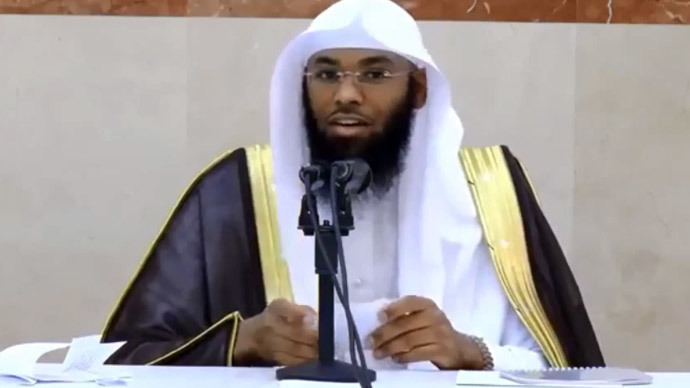 A Saudi cleric has appeared in a video rejecting that Earth revolves around the sun, claiming instead that it is “stationary.” His statements have incited a fiery response on social media. When questioned by a student about whether the Earth was stationary or moving, Sheikh Bandar al-Khaibari responded with “stationary and does not move,” Saudi-owned broadcaster Al-Arabia reported. He then attempted to support his theory with a strange blend of logic and clerical statements. “First of all, where are we now? We’re going to Sharjah Airport to travel to China by plane, [is that] clear? Focus with me, this is the Earth,” he said while holding up a sealed water cup. He proceeded to say that if the plane stopped dead in its tracks in mid-air, “China would be coming towards it in case the Earth rotates in one direction. If the Earth rotates in the opposite direction, the plane would never reach China, because China is also rotating,” he said. The shaky reasoning incited a torrent of responses on Twitter under a hashtag which roughly translates as #cleric_rejects_rotation_of_Earth. “Check out this hashtag if you feel like watching your IQ plummet,” Twitter user ‘ink’ wrote. “This is why you don't give khutbah [a public sermon] after smoking up,”Saijaz wrote. “No surprise women not allowed 2 drive w cretins like this,” one user commented, referencing the ultra-conservative absolute monarchy’s ban on female drivers. “Did somebody tell that guy that there are people literally live in space?” another wrote. Others thought the blunder was a good opportunity to educate the public on issues of science. The statements, rather ironically, were delivered on the birthday of Galileo Galilei, the 16th century "father of modern observational astronomy" who was persecuted by the Catholic Church for supporting heliocentricism – the astronomical model in which the Earth and planets revolve around the sun at the center of the solar system. #داعية_ينفي_دوران_الأرض What a coincidence that this would occur on Galileo's birthday! After being found "vehemently suspect of heresy," Galileo was forced to spend the last nine years of his life under house arrest. In 1992, the Vatican formally and publicly cleared Galileo of any wrongdoing.